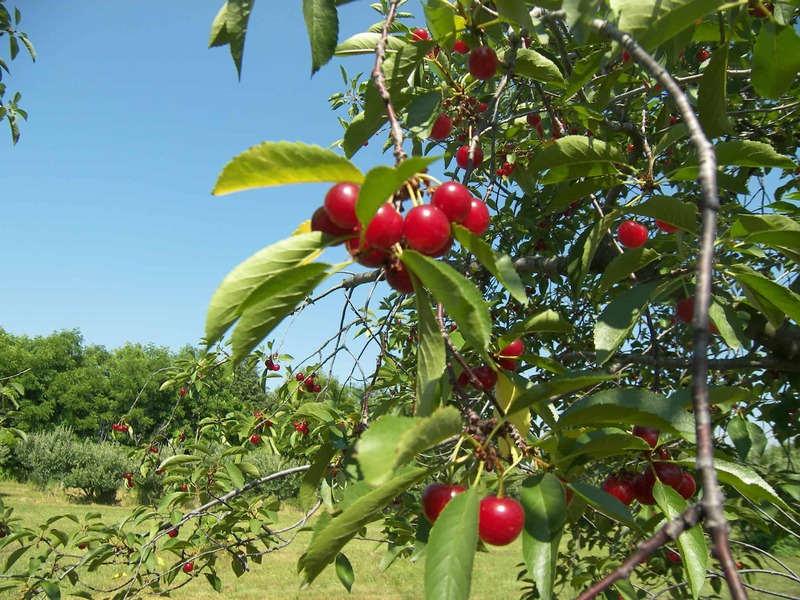 I have been anticipating picking cherries at Wasem Fruit Farm ever since I visited the farm when the cherry trees were blooming. That was a pretty sight, but not as beautiful as seeing ripe red cherries hanging around waiting to be picked. I headed to Wasem for picking on Friday, July 8th, 2011. It was a good day to come. I was able to pick over 7 pounds of cherries without the use of a ladder (although they do have ladders available to reach the higher up cherries.) 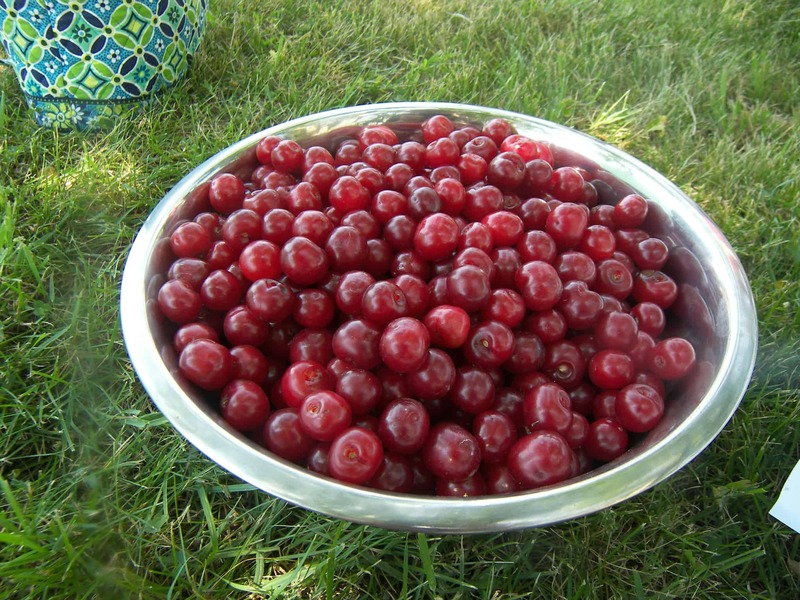 Even my 3 year old daughter was able to reach some cherries to put into her little bucket. 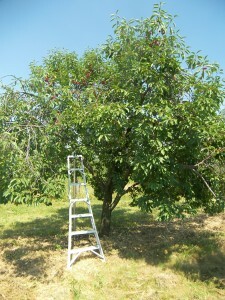 Buckets are available for you to use while you are picking cherries, but you will need to bring containers to take your cherries home. Also they have a table where you can pit your cherries with a hand crank pitter, once you have paid for them. I decided to wait to pit my cherries on my own, since when you pit them you need to use them up quickly. 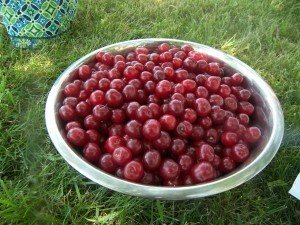 The pits are pretty easy to remove by hand, much easier than the other varieties of cherries I have pitted this year. 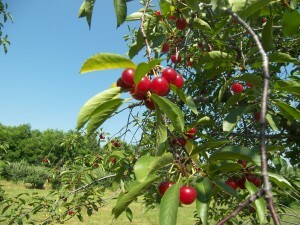 Wasem grows two varieites of sour/tart cherries: Montmorency and Balatan. I picked the Montmorency variety. They were tart, but if you enjoy tart things you certainly could eat them straight up. 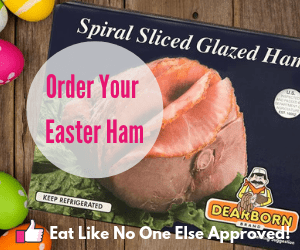 The cost is $1.50 per pound with a minimum charge of 5 pounds. They also offer u-pick on red and black currants, as well as red and green gooseberries. I decided to pick a pound of red currants to give them a try. There weren’t many gooseberries left when I arrived. Also during the fall, they are a great place to go and pick apples, which I have done several years in a row. 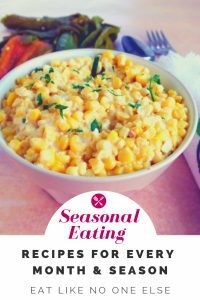 Wasem Fruit Farm is located at 6580 Judd Road, Milan, MI 48160. Their phone number is 734-482-2342. 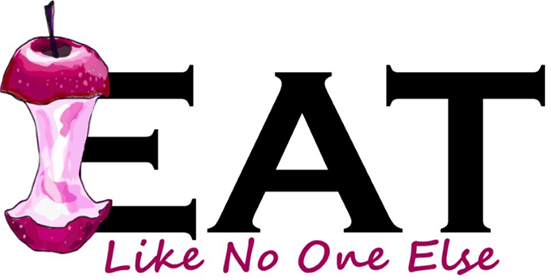 Click here for their website or facebook page.